This is the first post in some time and is intended as a start for the next steps in investigation on decision making in severe crisis. Note: Beginning with the stories on the PWH FORUM related to flying, I have started a new Blog RememberedSky.com focused on my experiences and those of my friends. What follows is the announcement set about a recently completed series on the return of the Viet Nam POWs. Asked below is the question, cannot a Katrina like diaster be considered a “captive environment?” Does not response, decision making and leadership in this severe crisis require unconventional leadership? My answer is yes, and there is much to be learned from the “isolated yet unifed” response by our Viet Nam POWs. Please note that I have opened a second website for aviation stories. I hope you will visit RememberedSky.com. The link is to Remembered Sky’s opening post. The best definition I have ever heard of a vocation is that it’s the place where your great joy meets the world’s great need. For you to build that vocation will take both compassion and courage. There are infinite possibilities for you for joy, for service, to make a contribution, and we need all of you to find your vocation. To develop your joys, your passions, and to match them to the world’s great needs. Please note that I have started a new website focused on aviation. This story and others are now on line at Remembered Sky. Given that this site is a continuing story, the link takes you to the very first post in September 2012. On April 10, 1972, Midway steamed under the Golden Gate Bridge in San Francisco, bound on a 7800 mile voyage to the Vietnam War Zone. This in itself was not uncommon. What made this cruise different from proceeding ones in the ship’s history was the fact that Midway was deploying over seven weeks in advance of the scheduled departure date with less than one week’s notice, with a vastly abbreviated training period, and with the additional handicap of a short, three day load-out. From Achieving Interoperability in Critical IT and Communications Systems by Bob Desourdis. When Bob Desourdis lectures on his book and “interoperability” for homeland security, he asks the technology focused audiences “what would you do if you had all the information you thought you needed and all the associated technology that would allow that information to be available?” He suggests strongly, we’d still not get things right. Project White Horse 084640 is mostly based on agreeing with Desourdis. People, ideas, technology… it’s always most about people… and the will to be ready for whatever might come, at all levels, leaders most assuredly, but also us. Please consider these introductory elements from Bob’s book and tutorial as you reflect on events and consequences from 70 years past. This information flow diagram shows the principal sources of knowledge that the U.S. had before the attack –yet complete surprise (codenamed To-ra, to-ra, to-ra) was still achieved. The diagram shows many, though not all, of the information available to authorities –but the lack of holistic interoperability meant to achieve Hawaiian defense failed. … there were many failures that haunt our more recent disasters and, in all likelihood, our awareness, response, and recovery from the next disaster. …from the minority report on the Pearl Harbor attack, when the two senators stated that it was “the failure of men,” and not any other reason, that led to the success of the Japanese attack. … these “failures” were well documented in the majority report and are presented in what follows. Note that the congressional investigation was performed in 1946, though the event was December 7, 1941, because Congress did not want to pull commanders out of the Pacific during the war. On December 8th, a second key quote –which belies many of today’s failed interoperability among people, processes, and tools, is that many people at all levels of leadership –and for various reasons we suggest in what follows –believe their abilities and capabilities are “good enough,” and they are inevitably wrong. •Missed, ignored, paraphrased, or failed to verify messages that failed to prompt an expected reaction. The remaining 12 Pearl Harbor failures (are)primarily leader shortsightedness and inter-organizational jealousy, letting their personal relationships impact their planning and decisions, while delegating responsibility with limited authority. (Now) show quotes from the 2004 9/11 Report and the 2005 Katrina Report demonstrating the same type of failure of organization as evident in the Pearl Harbor investigation. A clear lesson taught by 1946 that was ignored through 2005, and arguably is largely ignored today at all levels of government. As the day closed on September 11 2001, we began the process of “doing what we know”- we had been attacked – strangely suprising to some in other lands, Americans strike back hard when treaded upon – so we went to war in the way we know how. The events of September 11, 2001 were of such magnitude, shock and so far outside the norm of how we perceived warfare, and our whole intelligence process was so much still Cold War mind set, we didn’t “know what to do” …really. We attacked, we fought, we used B-52s and smart bombs with special forces guys doing the targeting and riding with Afghans on horses. We learned, but we were still doing what we know not knowing what to do. After the invasion of Iraq, that became apparent - who exactly were we fighting, how many groups, were they connected? We learned, the hard way. Army General Petraeus and Marine General Mattis rewrote the counterinsurgency manual – many had long fought even using the term insurgency. Americans fought, Americans died, some learned. But it has been a tough think. What kind of war have we been fighting: guerrilla warfare, non conventional, unconventional, fourth generation, irregular? Is the answer counterinsurgency, counterterrorism, what? The debate on whether what applied in Iraq applies in Afghanistan still ebbs and flows – below the surface for most Americans. So questions still persist; Are we better off ten years later, have we gained the imagination so lacking pre 9-11, are our leaders really prepared to make the decisions necessary in a world so ill defined, indeed, are we capable of knowing what to do rather than doing what we know? Like most Americans over the past week I’ve searched the blogs, read the opinion pieces, the stories of the folks most directly involved, watched hours of commentators and ceremonies and dedications. I’ve searched and struggled to find words for this blog, given the focus on decision making in severe crisis. Below are three articles and links to the originals that surround the idea of learning and focusing so that we as a people – top to bottom – can know what to do. They are well worth your time. One introductory comment, then the rest stand on their own needing no help from me. The first article is about Rick Rescorla. His story has been featured here before. (See Sheepdog of Morgan Stanley) He may be the only person who knew what to do on September 11 2001. Learning from the first WTC attack, he prepared those at Morgan Stanley for what he was sure would be another attack. Ignoring Port Authority notice to remain in place after the attacks, he evacuated Morgan Stanley employees. Were it not for him, the losses at the twin towers would have been not 2800 but 5300. Knowing what to do is possible – it takes constant learning and the will to stay the course. Day is done, what next? Late Sunday, June 1st, 2001, my wife, Caroline and I pulled into the front of Rick and Susan Rescorla’s condo. In keeping with his ebullient personality, Rick had hung his signature First Cavalry jacket on the porch light. Always larger than life, he bounded down the steps with a welcoming smile and bear hug. He was that kind of guy, absolutely fearless and totally selfless. A singer of songs in the face of the enemy, he calmed his men on Landing Zone X-ray as they awaited a North Vietnamese attack at dawn–and later after the attacks of 9/11. That was Rick. Big guy–must have been over 6’2”, Bunyanesque in life. He was a hero to all of us, fellow lieutenants and enlisted. In Vietnam, while serving with the 2nd Battalion 7th Cavalry in 1965, he invented what became officially known as the LURP team. And later, he was featured on the cover of We Were Soldiers Once…and Young. In later years, I got to know Rick as a man of insatiable scholarly curiosity and intellect as well as a father. Ten years ago on September 11th, at about 6:30 pm, I made the hardest phone call I ever made in my life–to Rick Rescorla’s wife Susan. I hoped against hope that he had not gone to work that day in the World Trade Center. I hoped he and Susan had taken the opportunity to enjoy one of their day trips to the Jersey countryside. But somehow deep down inside, I knew I had lost a friend. Inside that bag he had given me that June was a beautiful wooden box, the kind you keep on your dresser, with your watches, your precious jewelry, and your memories. His box is still on my dresser and not a day goes by that I don’t thank God for the privilege of counting Rick Rescorla as a friend. Rick, head of security for Morgan Stanley, managed to evacuate the 2500 employees of the South Tower on 911. There are photos of him singing to calm the evacuees. Rick was last seen climbing back up the stairs to make a final sweep before the building collapsed. Rick’s physical remains have never been recovered but his spirit will never die. His statue is now permanently placed on the grounds of the National Infantry Museum along with a piece of steel from the building. Ten years ago a petition began to circulate calling for him to receive the Presidential Medal of Freedom. It went viral and garnered thousands of names. Conversations with the White House staff were held, but nothing ever came of it. Now, as we pause to recall those who stood up on 911, there is a pall cast by the lack of recognition of Rick’s valorous sacrifice. Those of us who knew Rick and served with him in combat are still trying to see that he gets the national recognition he deserves. He has been honored in his native England, his hometown of Cornwall, and by his friends who contributed to the Columbus Georgia memorial. The man who saved more people on one day by his actions has not been awarded the Presidential Medal of Freedom. If he had been fighting on foreign soil, he would have received the Congressional Medal of Honor. Damn shame ten years later, our leaders have not honored this immigrant citizen who so magnified our American values. CP Note: *Watch “Voice of the Prophet,” an interview with Rick Rescorla, done with Robert H. “Bob” Edwards’ son Robert Edwards, who fought at Ia Drang with Rick. In the interview, Rick all but predicts the attacks of 9/11. 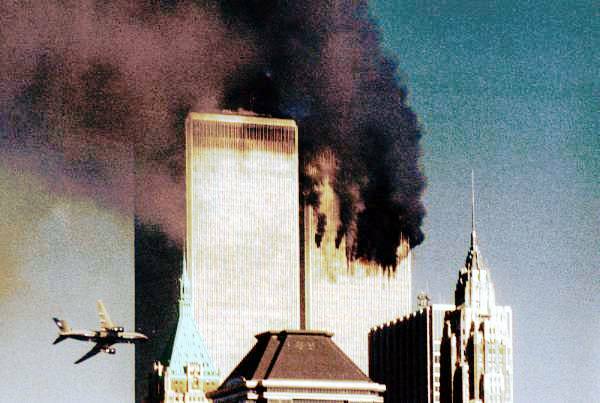 Ten years ago to this day, almost to the hour of which I am writing, commercial jetliners were highjacked by al Qaida teams armed with boxcutters, under the direction of Mohammed Atta, were flown into the towers of the World Trade Center and the Pentagon. A fourth plane, United Airlines Flight 93, believed to be headed to the US Capitol building, crashed in Pennsylvania when passengers led by Todd Beamer heroically attempted to stop the highjackers. The whole world watched – most with horror but some with public glee - on live television as people jumped out of smoke-engulfed windows, holding hands, to their deaths. Then, the towers fell. Say what you will about the messenger, but “Courtney” was right. September 11th was a watershed event for an entire generation of Americans; one which would dominate their worldview for much of their adult lives. Sure, some might scoff at the jubilant crowds gathered around the White House after news leaked of Osama bin Laden’s demise at the hands of US Navy SEALs. But while September 11th may not have been as militarily significant as, say, Pearl Harbor, it was no less visceral: New York and Washington weren’t mere US territories thousands of miles from the shores of the US, as was Hawaii in 1941. The Pentagon and World Trade Center were fixtures in the lives of everyday Americans; and in the 21st Century, live footage of the conflagration could be piped into every home in America in vivid color. And though only a tiny portion of America would serve in uniform in the decade to come, the effects of the attacks would permeate nearly every aspect of our lives: the economic downturn, terror alerts, airline security, even the ubiquitous news ticker, now a staple on nearly every cable news station. But above all, there was the culture of fear. Osama bin Laden, for all of his malfeasance, certainly didn’t pose the same existential threat to the United States as Imperial Japan, Nazi Germany or the Soviet Union. Yet, his escape from the wrath of the US military, and his wraith-like presence for nearly a decade gave him the allure of a boogeyman. And, like many boogeymen, simply whispering “Osama bin Laden” or “9/11? could frighten and cajole Americans into rash and irrevocable actions: torture at Guantanamo, the invasion of Iraq, and trillions sunk into wasteful security programs. Yet, for all our mistakes, al-Qaeda erred even greater. The invasion of Iraq might have been a massive recruiting boon for al Qaeda and its Iraqi affiliate, but by the end of 2006, the organization had overplayed its hand. Local sheiks, and even former al-Qaeda members eventually joined US forces in a counter-offensive against al-Qaeda in Iraq, having been sickened by the violence unleashed by Zarqawi and his minions. The movement, dubbed “The Awakening”, was seen by many as a turning point in the war in Anbar Province. Meanwhile, in Pakistan, remotely-piloted drones pounded away at the Federally Administered Tribal Areas, keeping senior al-Qaeda figures at bay. Finally, the organization was dealt a deadly blow when US Navy SEALs mounted a spectacular raid into a compound in Abbotabad, Pakistan, killing the former al-Qaeda leader who had spent nearly a decade presumably under house arrest, under the watchful eye of the Pakistani government. Months later, a fierce drone campaign picked off al-Qaeda’s number two operative. And though US officials are rightly cautious over alleged terror plots timed to coincide with the tenth anniversary of 9/11, they’re nowhere near the size or scope of 9/11. Reduced to underwear bombs, al-Qaeda is a mere shell of its former self. But though we may have crippled al-Qaeda, we’ve been weakened, too. Thousands of American troops have been killed in wars abroad, and tens of thousands more have been horribly wounded. Our national debt has surpassed fourteen trillion dollars–roughly our yearly Gross Domestic Product. Unemployment is rampant, and our collective confidence is shattered. Our public image has been bruised, and partisan rancor cuts so deeply that we cannot even agree upon a decent memorial to commemorate the victims of 9/11, even ten years later. As a nation we can be shallow, petty, and selfish. But deep down, we can learn to sacrifice and cooperate. Shortly after the attacks of September 11th, our rallying cry was “Let’s roll”: a call not just to punish the perpetrators of this odious act–rightly so–but also to rebuild. Ten years later, it’s time to start rebuilding. For nearly a decade, our national wheels have been chocked with pernicious emnity and fear mongering. It’s time to finally pull out the chocks and roll. The Project White Horse 084640 post for Fourth of July 2010 noted that we celebrate our country’s birthday in the warmth of summer recalling the day we declared our right as free and independent states, the day the signers pledged their lives, fortune and sacred honor, but that we would do well to also recall a bitter cold Christmas night, a general and an army that made it so. “And for the support of this Declaration, with a firm reliance on the protection of Divine Providence, we mutually pledge to each other our Lives, our Fortunes, and our sacred Honour” offered a narrative connection of the 4 July adoption of the Declaration of Independence with the Christmas morning Battle of Trenton as possibly representing the singularly most significant or compelling event in our country’s history to this day. Without Trenton there would have been no “Spirit of 76″ out of the 4th of July. And yet beyond Trenton, Princeton, and the Petite Guerre of winter 1777, Washington and the Continental Army again found themselves in dire straits through the next winter at Valley Forge. It was not until the little discussed Battle of Monmouth 28 June 1778, that Washington’s perseverance and leadership and commitment to the training for European style battle gained at Valley Forge began to indicate the real possibility that the aims of the Declaration could actually be gained. We celebrate a day, but our independence is a narrative that ebbs and flows. It cannot be understood or grasped from one event or the decisions around that occurrence. It is easy and understandable to find ourselves in the great American game of baseball, high fiving the coach at third base, losing site of the fact that we didn’t hit the triple that got us there, nor is there guarantee the next batter will bring us home. We won the lottery of birth but what do we owe and what must we continue to do in recognition of our luck? The fourth part of DaVinci’s Horse posted in Spring 2008 sixth PWH edition concluded with a point out of East of Eden (1952) by John Steinbeck which tells the stories of three generations of two families, focusing on the theme of good against evil and making prominent use of the biblical story of Cain and Abel. Cain murders his brother out of jealousy after God rejects his gift but then accepts Abel’s. In the novel, Steinbeck ascribes great significance to the translation of the Hebrew word timshel (“thou mayest” or “thou will”) overcome sin or evil. He believes it demonstrates that humans have free will and can triumph over sin if they choose to do so, but victory is not guaranteed. On the Plains of Hesitation, bleach the bones of countless millions who, at the Dawn of Victory, sat down to wait, and waiting died. Said then and again now on 4 July 2011, I submit to you that those frontiersmen who defied Great Britain at risk of everything dear in fathering this nation, recognized full well that they were not guaranteeing anything, knew that what they had crafted was inherently flawed, and realized that what they had accomplished was to place a new nation at the dawn of victory – not for a year or a decade or a century but for as long as the people of the nation could reproduce the resiliency – spirit, blood, and treasure – of 1776. The Observe Orient Decide Act decision making process, or as it is commonly known, OODA Loop, was evolved over time by John Boyd in search of improvements in capability in the highly competitive environment of war. Over time many have come to see the worth of the OODA process as instructive in any competitive environment. Indeed Boyd’s last work summarized his thinking in stating “without OODA loops… and without the ability to get inside other OODA Loops (or environments) we will find it impossible to comprehend, shape, adapt to, and in turn be shaped by an unfolding, evolving reality that is uncertain, ever changing, unpredictable.” Many consider Boyd and the “loop” in only the context of having a faster loop than the competitor. But the real value is found in the realization that the OODA loop in its complete form is really a process of learning – a way of search, analysis, synthesis, and aquistion of actionable understanding. As such it is offered here as a crucial element when considering a culture of preparedness and the make up of resilient communities. The video below was developed for youth soccer coaches based on the OODA process. I think you will find the method of presentation enlightening. You should be able to navigate to all 17 currently available segments. Each lasts 2-3 minutes. Forum for exchange of ideas augmenting the PWH electronic magazine by publishing discussion threads and articles “between” editions. There are 114 posts and 0 comments so far and RSS feeds are available for both.